We all had a good term and are happy that we have 3 new friends at school. We had a "Christmas in July" for the first time ever and it was really a fun, and nice surprise. We all got a wrapped present with our name and photo on the front. 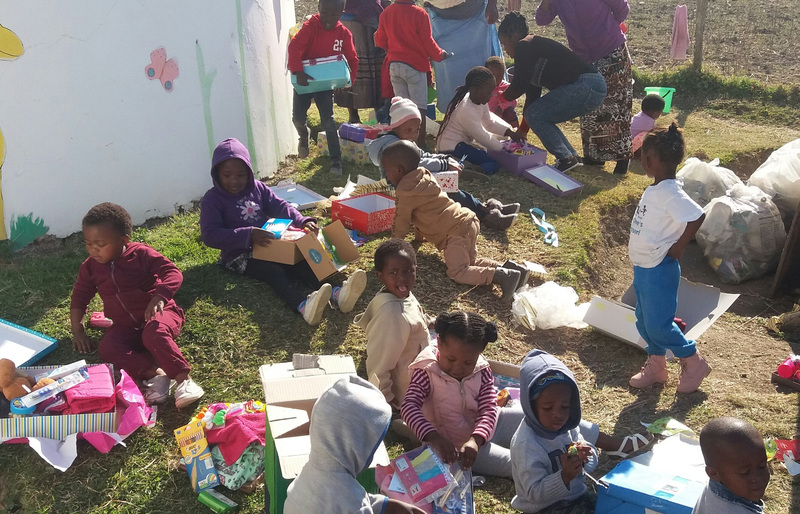 In our gifts were clothes, toiletries, sweets and a toy. Thank you very much to the children at Morning Star Montessori for this kind action. You made us really happy. A big thank you to Mr Dolley from the South African Hockey Association for the lovely child friendly hockey sticks and balls you donated. We will make very good use of this equipment to develop many skills - thank you! We joined 150 000 children from around the world, to Sing Peace on World Peace Day, 21 September and we had a discussion about what peace actions we can do in our community - it was good. 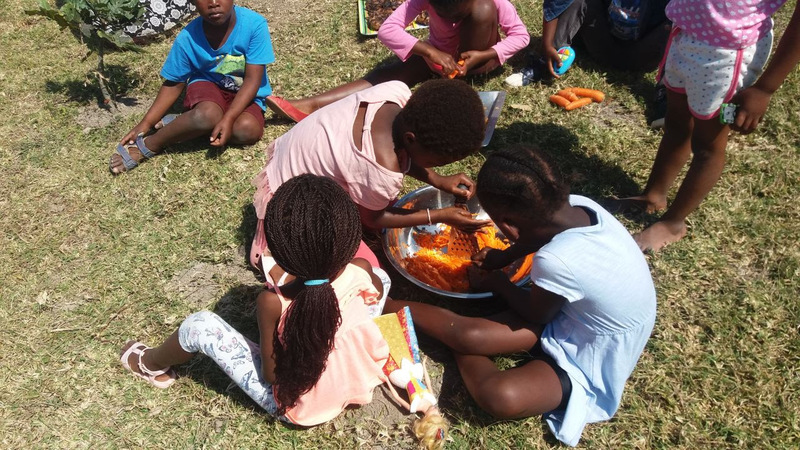 We enjoyed a chicken braai for the end of term, and we peeled and grated all the carrots and spread margarine on all the bread, because we know how to do it ourselves! We are really looking forward to using our new Yann Eric eating area next term - thank you very much to Mr Helge Reistad and his family for this lovely donation. The Yann Eric eating area for Ncinci One's is nearly complete - good building Sandiso! A very special thank you to Helge Reistad and family who donated this wonderful building to us, in memory of Yann. The 'old' rondawel and kitchen floors were also re-done, so everything is now nice, straight and dust-free! 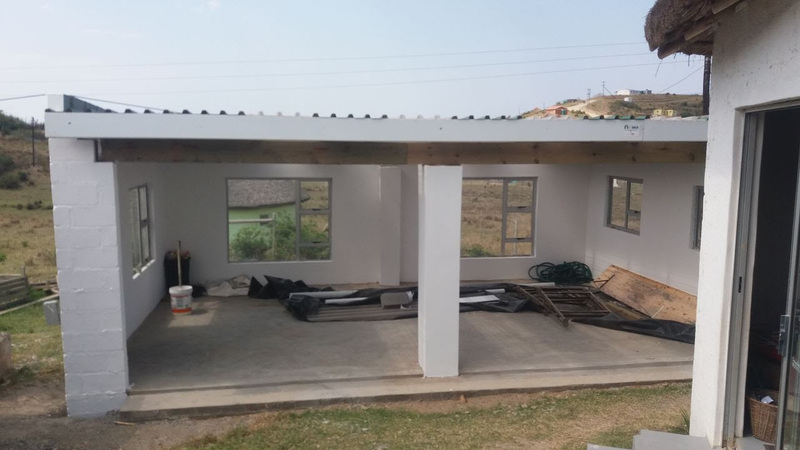 The eating area will also be used for the After-School Enrichment programme, that the community has asked us to start. We are in the process of seeking funds and partners, for this much-needed project. 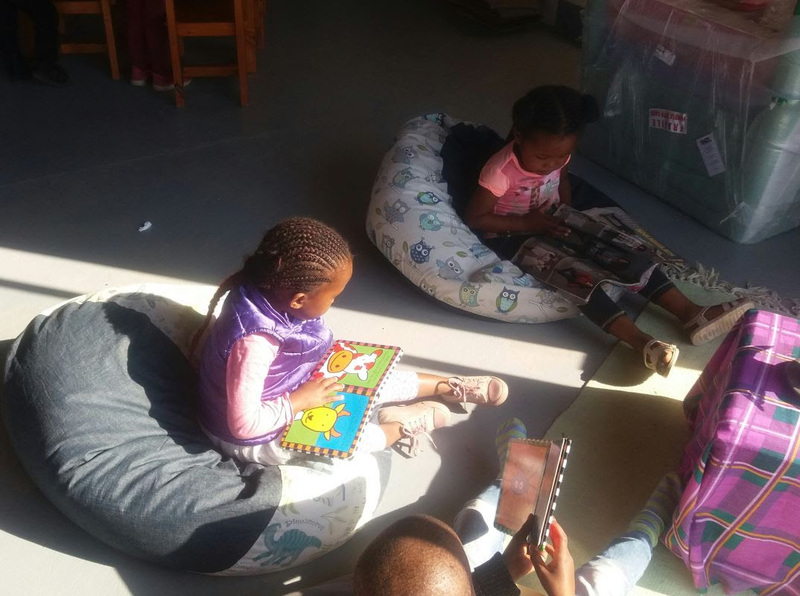 Nosandise and Luyolokazi, our Xhosa teaching assistants, are very excited to be attending further Montessori training during the holidays with Jen and Xoliswa from First Children. 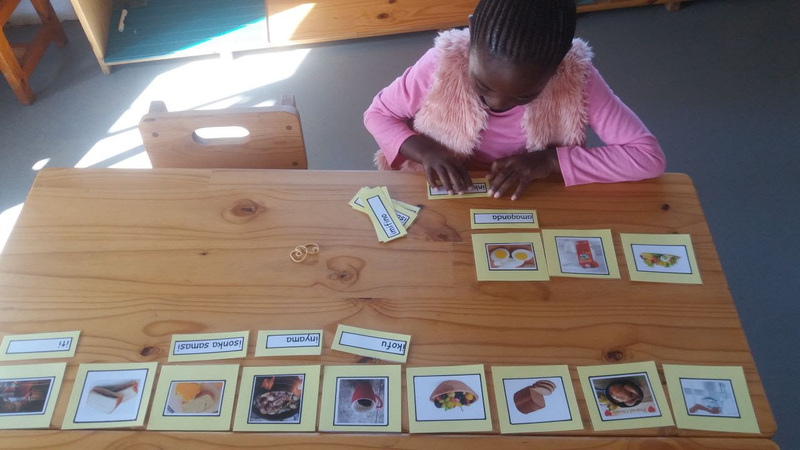 Khanyisile, a 4-year old girl had mastered the Large Number Rods, her rote counting was good and she was ready for the Sandpaper Numbers. I said to Khanyisilethat I want to check her numbers, and as I randomly flipped through the Sandpaper numbers, she could recognize and name each number. I was totally gob-smacked. I asked her who had taught her numbers and she said "no-one". I asked her how she learnt the numbers and she answered me by saying, "I observing". What amazing Montessori Magic! We are still looking for a few Sponsors please! 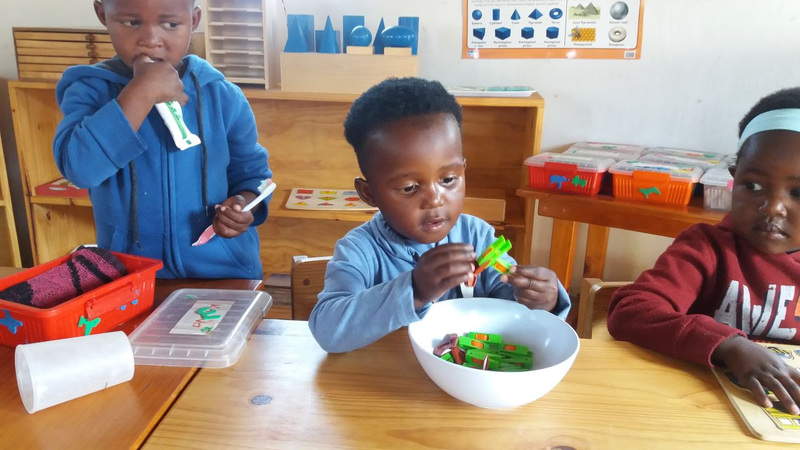 For only R500 (U$38, E33 or GBP29) per month, you will be providing a young rural child with a solid Montessori foundation, in a beautiful, stimulating and nurturing environment; 2 nutritious meals and a daily calcium supplement; regular health checks and 3 day de-worming twice a year. You receive: Good karma for helping a rural child get the best start to life! We will update you with a quarterly newsletter and you can request an update and photos of the child that you sponsor, at any time. Please consider arranging sponsorship of a Ncinci One's child through your school, group of colleagues, or friends. Ncinci One's Montessori is still looking for a 'sister' school. If you know of a school that would like to partner with our project, please do contact us. We urge you to walk this road with us! 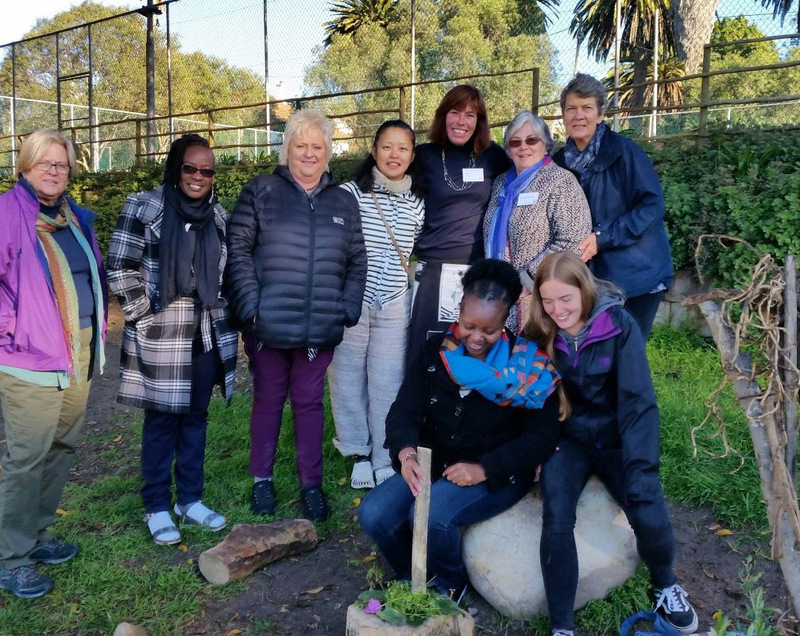 WOW - what a wonderful, busy third term I have had :-) I was immensely blessed to be able to join the 6th ESF Assembly which was held at the Sustainability Institute in Stellenbosch for 2 weeks in August. There were 86 professionals from 28 countries at the Assembly and included in the delegates were Montessorians, a Professor, Psychologists, a Neuro-scientist and an Architect. It was hugely humbling to be in the presence of these amazing people with such immense knowledge. Our days included community work, reading groups, presentations, discussions, dancing, drumming, beading and enjoying delicious food and wine. Well done to Gerhard de Villiers and team for the lovely food, always so perfectly presented. The powerful, intense, energizing, passionate experience was absolutely life changing and I met the most wonderful people, doing incredible Montessori work all over the world! There was so much love, knowledge, laughter, tears and friendship! Thank you very much to Lynne Lawrence and the AMI team - you guys organized an incredible assembly! 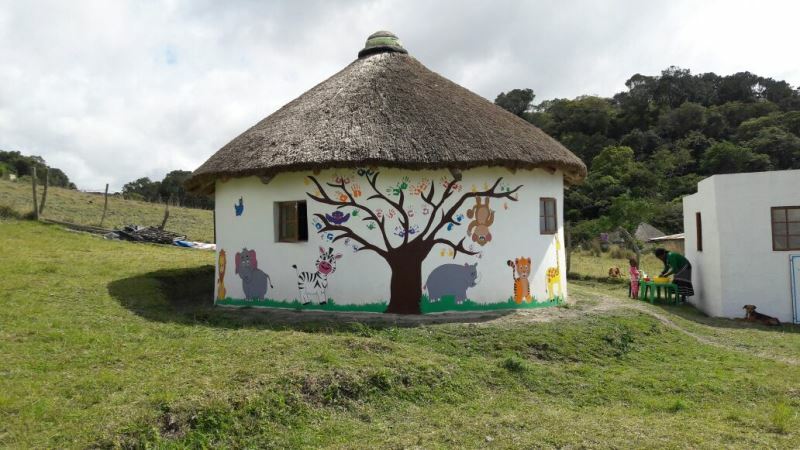 I have made many new Culture and isiXhosa Language materials for the environment this term and have also been busy with Fundraising and other really good on-line courses with Philanthropy University. Ncinci One's Montessori has been blessed again this term. The kindness and support of many people keep our project going and growing! For this last quarter, we would like to thank the following people and organisations for their amazing support. 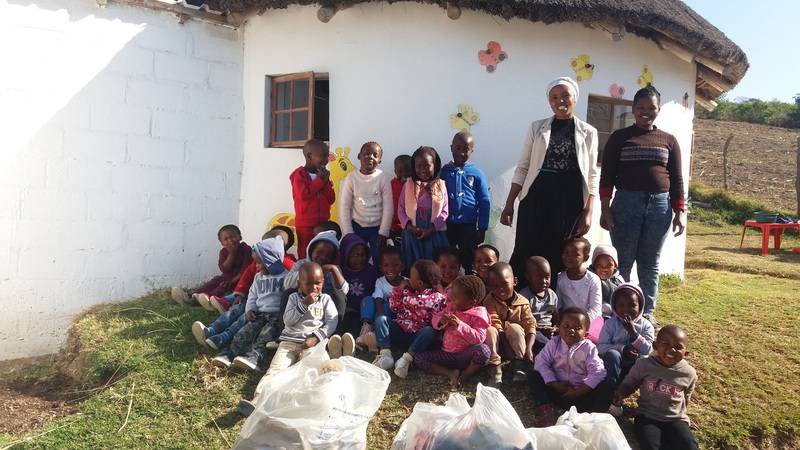 Without you, our Early Childhood Development Centre would not be sustainable and we would not be able to offer these young, rural children the great opportunity they are getting. From the bottom of our hearts, thank you all very much for your support! One of our ladies at school is going off for two weeks in October to do Ukuthomba. The Ukuthomba ceremony is decided by a woman's family, when they feel that she needs to be protected or healed. The woman will return to her home and she will go into an un-used rondawel. Grass mats will be hung inside the rondawel, to divide the hut. Her head will be shaven and she will remove all her outer clothes. She will use a Xhosa blanket to cover herself. For 2 weeks, she will remain behind the grass mats, and she has no name for those 2 weeks. She may not see or speak to anyone or communicate with anyone. The woman who helps the initiates during the ceremony is called an ikankata. Women can do this ceremony by themselves or in small groups. After 2 weeks, the woman comes out from behind the mats and there is a huge celebration! Animals are slaughtered, the long-ago prepared Umqombothi is drunk and then everyone in the village joins in the festivities.